Lake Deforest Bascule Gate - Clarkstown, N.Y.
Lake Deforest is a drinking water supply reservoir maintained and operated by United Water Company of New York. 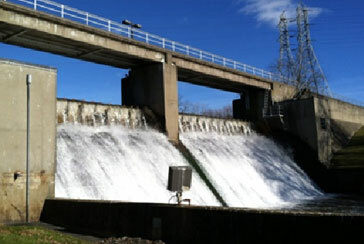 The dam was constructed in 1954 with a bascule gate system to controlling reservoir levels and last upgraded in 1988. The project was to provide design/engineering services, permitting, furnish and install two new 50-foot long by 5-foot high bascule gates, with 260 linear feet of new schedule 80 stainless steel welded pipe contained in a 316 stainless steel trough and upgrades to the hydraulic pumps and system. Reservoir operations had to be maintained during the construction and upgrades. This mandated the execution of the work to be phased and sequenced in order to maintain operation of one gate system, requiring utilization of coffer dams to complete the work. Jett Industries work with Hatch Associates for design services and Steel Fab, Inc. for the manufacturing of the new bascule gate system.